The Wall St Journal once dubbed Steve Levitt, the co-author of Freakinomics, the 'Indiana Jones of economics'. But if that swashbuckling label belongs to any economist, it's Bill Phillips. In between leaving New Zealand in 1935 and his first brush with economics in 1946, Phillips worked in a gold mine, hunted crocodiles, busked as a self-taught violinist, rode the Trans-Siberian railroad to the East where he was arrested by the Japanese as a suspected spy, then eventually got back to London just as war started. He joined the RAF, who sent him back to Singapore as an engineer working to upgrade obsolete airplanes. He was on the last convoy out of Singapore, on a cargo ship crammed with over 2000 people, mainly terrified woman and children. When the convoy was attacked by Japanese aircraft, he improvised a mount for a machine gun and stood there for hours firing at attackers. For that he got an MBE, but also 3 years in a prison camp. He said the small men survived while the tall men starved (he weighed 7 stone by the end of the war). He built concealed radio sets, one of which was small enough to be hidden in the heel of his shoe. And he built little immersion heaters, which the prisoners used to make morale-boosting cups of tea every evening. After the war he went back to the London School of Economics, where they were starting to introduce engineering style mathematical equations to measure and understand economics. In his spare time he built a hydraulic representation of the equations. 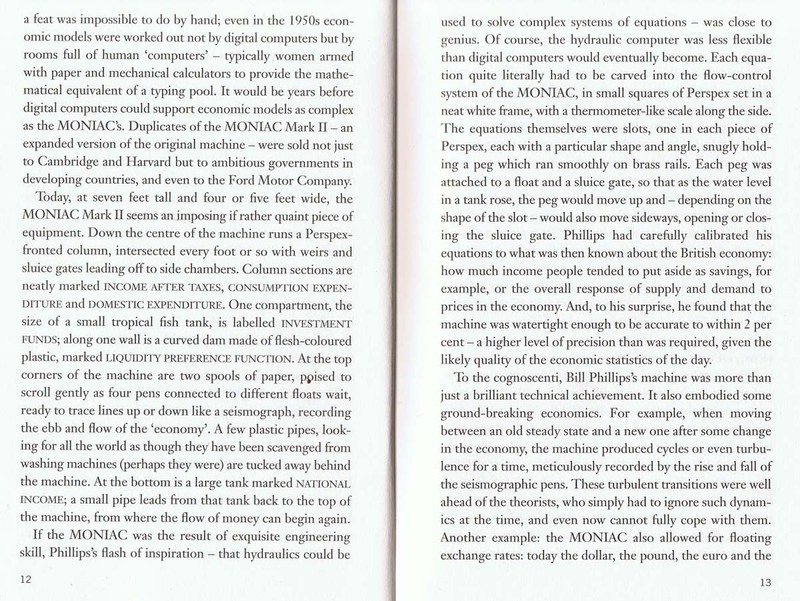 It was the first ever computer model of a country's economy - the MONIAC, or Monetary National Income Analogue Computer, better known simply as 'The Phillips Machine'. It worked off scavenged pumps and perspex and plumbing from junked airplanes. It could solve nine different equations simultaneously and within minutes - something which simply couldn't be done by hand, or by calculators of the time. Obsolete now, of course, but NZ Central Bank keeps one on display, while the original LSE model is in the Science Museum in London, sitting opposite Charles Babbage's Difference Engine. The world is full of people who tell you that economics is simple. Balance the budget. Protect manufacturing. Eliminate red tape. Ignore anyone who tries to tell you that economics is "just common sense". Monopoly games sometimes run out of cash. Players often deal with this by writing IOU's. But there is another way - simply agree that all banknotes are worth double the face value, and give half your cash back to the bank. All rents and property prices are effectively halved, so you can still buy exactly the same amount with your halved pile of cash. We have ideas of fairness. Consider this scenario: a small shop has one employee paid $18 an hour. But factories close and other shops hire new workers at $14 an hour. Is it OK for the $18 an hour guy to be reduced to $14? Even though cd say unfair for the guy to be getting more than others, or unfair on shop owner to have to pay extra, almost everyone agrees that it wd be unfair to reduce the guy's wages. Price of a bottle of Coca Cola stayed at 5 cents for seventy years - from first sale 1886 to 1956 - because vending machines only took nickels. Too expensive to refit machines to accept pennies as well, and to double the price to 10 cents which would be a hard sell. The company got so desperate that they (seriously) petitioned Eisenhower to introduce a 7.5 cent coin. What can babysitting teach us about economics? Quite a lot, if you ask Tim Harford, a writer and broadcaster with a fascination for the economics of everyday lives. Back in the 1970s in Washington DC, a group of parents formed a co-operative to babysit each other's progeny, using their own unique quasi-currency to pay for the service. Before long the 200-odd parents, largely congressional staffers, started trying to build up reserves of their currency. They tended to stay at home and hoard it rather than spending it on babysitting services. Their tiny co-operative economy effectively went into recession. The answer, it turned out, was simple: the parents printed extra currency. The money supply started growing and parents started going out to the movies again. The story of the Capitol Hill Babysitting Co-operative was first made famous by Paul Krugman, the Nobel prizewinning economist and blogger, as an example of how easy it can be for a central bank to fix a recession. It is related again, with an added twist, in Harford's new book. Harford, a Financial Times columnist and presenter of Radio 4's More or Less, is best known for his work on microeconomics, homing in on everyday matters such as coffee prices, gambling in Las Vegas casinos, bosses' pay packages and the tactics behind speed dating. In the new book he looks at the world through the wide-angle lens of macroeconomics - the management of entire economies. Harford manages to explain the topic with beguiling clarity and in the effortlessly breezy style that has characterised his previous books. As the babysitting episode shows, sometimes economies take to their sick bed for no obvious reason. With a bit of tinkering, recessions can be cured. One way is by printing money to grease the wheels and encourage spending. However, as the recent funk in the West proves, economic policy rarely boils down to clear and straightforward answers. As a result, disagreements between economists over whether to print, ramp up government borrowing or stand back and let a recession take its course tend to degenerate into bad-tempered, ideological mud-slinging. Harford spurns the polemical style that infects so much writing about macroeconomics, offering a clear exposition of the key debates using case studies ranging from Second World War POW camps to the 1970s oil shock and Brazil in the 1990s. In doing so he also explains the elusive concept of money, taking in not only the gold standard and bitcoins but the Micronesian island of Yap, where the currency was stone wheels more than 4 tons in weight, one of which sat at the bottom of the sea. Yap's currency might seem singularly odd, but Harford makes a convincing case that it is considerably less crazy than the monetary system we use today, based on circulating bits of paper. Harford's sympathies and passions lie in microeconomics, and this comes across in the book. Macroeconomics, he suggests, is a profession facing something of a crisis after its theories proved incapable of responding to the banking crisis of 2007-09. The critique is fully justified. Economists employed by investment banks regularly appear on TV confidently to offer forecasts that turn out to be wrong. The academic world, meanwhile, is slave to elegant but largely irrelevant models while remaining deeply suspicious of new ideas such as behavioural economics. While Keynes argued that master-economists should combine the gifts of the mathematician, historian, statesman and philosopher, modern macroeconomists tend to have a far narrower focus. Harford discusses this complex field in the Q&A format used in his columns. Some readers might find this wearing over 285 pages, but it is a good way of leading the reader by the hand through what can be an inaccessible subject. Harford explains the subject with impressive clarity and wit.